Ethereum price analysis: Half gone in March; where are the bulls who said ETH could overtake BTC? ETH loses half value in March alone. Argument of ETH overtaking BTC, missing in action. Ethereum lost more than half of its value in the month of March alone while it wasn’t a long ago when bulls clamoured that Ethereum would overtake Bitcoin in terms of market capitalisation by the end of ths year. The year is not lost yet, but for ETH to go past BTC, it needs to show that in terms of price action, which is missing. ETH is down more than 1 percent at $387 in Sunday trading and has lost more than 53 percent alone in March, a month that saw negative news pouring from all corners of the world, such as regulation by the government bodies, central bankers and ad bans on the cryptocurrencies and ICOs by Google, Facebook, Snapchat and Twitter. 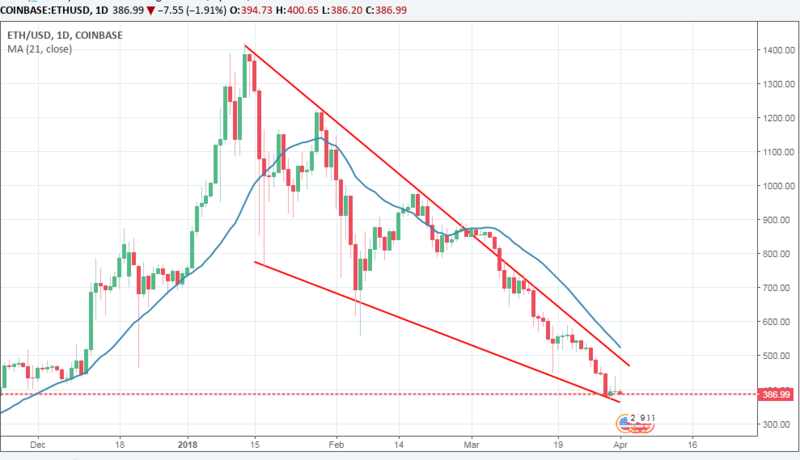 Technically, ETH is showing a bullish sign on the daily chart, falling contracting channel with features of falling wedge, a breakout of which would be extremely bullish. On the intra day charts though, resistance is at $401 and $413 levels while supports exist around $381 and $369 levels. The trendline channel support is around $350-60.